Impeccably maintained first-floor end unit with a 2 car garage. This unit with open floor plan has 2 bedrooms, den, and 2 bathrooms. Offered turnkey furnished with plenty of upgrades to include tile in all living areas and lanai, crown molding, HVAC replaced 2018, water heater replaced 2017, Kitchen Whirlpool stainless steel appliances in 2018, and Samsung washer and dryer in 2017. 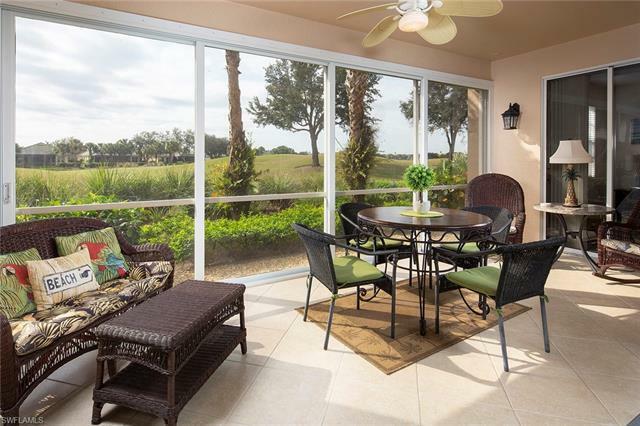 The lanai is enclosed with impact glass sliders and has wonderful Southern exposure view of the golf course. Neutral colors throughout make this easy to make your own. Shadow Wood Country Club offers 54 holes of private golf membership, private beach club, pickleball, members-only restaurant, fitness facility, lap pool, fitness classes, tennis courts and an active lifestyle. Minutes away from SWFL International Airport and Coconut Point mall for a variety of shopping, dining, and entertainment options. Selling Agent: Ryan Whittaker P.a.